That's the teaser on the front page of the November issue of Down East magazine. Inside, the story is just a short entertainment piece saying that the world's highest national annual murder rate––86 murders per 100,000 people––is in Honduras, but that the annual murder rate of the village of Cabot Cove, Maine, far outpaces Honduras. Cabot Cove's rate? It's a stunning 149 per 100,000 people. Cabot Cove, as you probably know, is the fictional Maine oceanfront village that is the setting for TV's Murder, She Wrote, which starred Angela Lansbury as mystery writer Jessica Fletcher. The show appeared on CBS for 12 seasons, finally ending in 1996, when the network killed it by scheduling it against Friends. Cabot Cove, which was supposed to have a population of 3,560, experienced 5.3 murders per year. Yikes! According to an article in the New York Times some years back, almost two percent of Cabot Cove's residents were bumped off during the show's run. Some good news for the town's endangered population, though, was that more visitors died than residents. 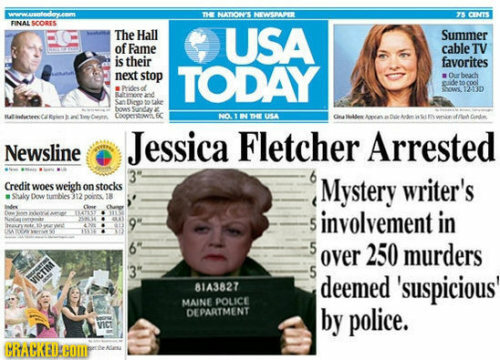 And Jessica Fletcher did go on the road from time to time and encountered some of her murder victims away from home. I'm guessing the townies breathed a sigh of relief when they saw Jessica leaving town. We all know that fictional towns in murder mysteries––onscreen or in books––don't bear much resemblance to real-life towns. 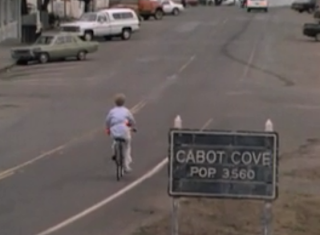 And Cabot Cove isn't just unrealistic in its murder rate; it's also not very Maine. First of all, it wasn't filmed in Maine. 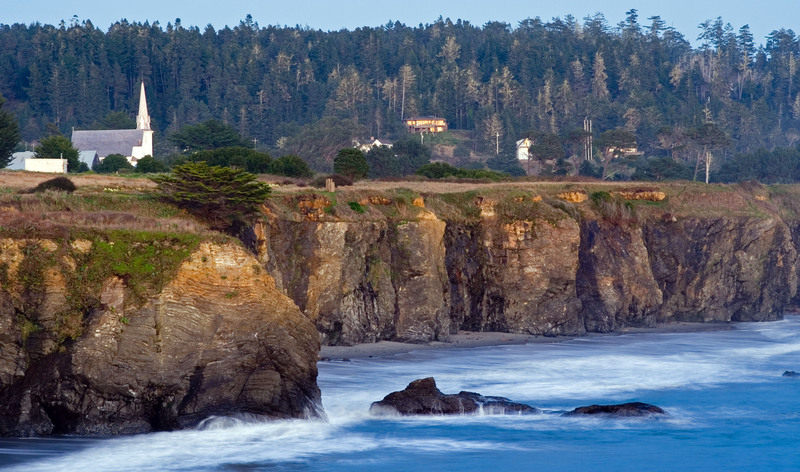 Cabot Cove is mostly Mendocino, California. Any Mainer could tell you that the coastline of Cabot Cove looks very different from the Maine coastline. The Maine accents by the regulars on Murder, She Wrote make Mainers wince. The biggest offender was Tom Bosley's Sheriff Amos Tupper. 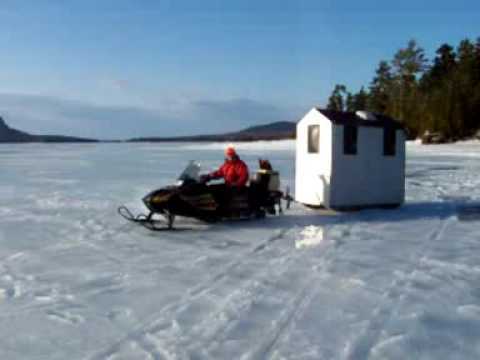 If you want to learn how to talk with a heavy-duty Maine accent, check out Tim Sample. Even the murders in Cabot Cove weren't very Maine. Not that we actually have very many murders in Maine, and certainly not many that are at all mysterious. 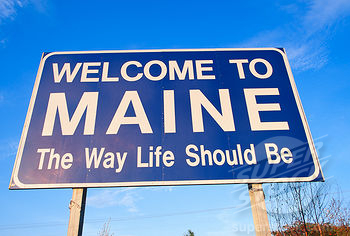 Still, I'd expect something more in the spirit of Maine life. If I were to dream up a Maine murder scenario, I'd want it to have that certain downeast flavor. I remember when I was in high school, a couple of our town's selectmen got into a feud. It got so bad that one of them, let's call him Mr. J, tried to run down the other, Mr. B, in the parking lot at the IGA. Luckily for Mr. B, Mr. J was a lousy driver. If Mr. J had done a better driving job, it would have made for a sensational murder story but, given that he did the deed in full view of a dozen or so grocery shoppers, not exactly a mystery. So we'd need to tweak the story. In Maine, for almost six months of the year, about every fourth vehicle on the road is a truck with a snowplow mounted on the front. Mr. J could have waited for a time and place without witnesses (pretty easy to do in a state with our low population density) and taken out Mr. B with his truck's plow blade. Then, just plow the guy into a snowbank and months could go by before Mr. B. 's body would be found. By then, it would be pretty tough to figure out exactly when the murder occurred, and any gore on the plow blade would have been scraped off. And there are so many other possibilities. Your average Maine home is chock-a-block with murder weapons: tractors, chain saws, mauls, varmint poison, shotguns, bows and arrows, buck knives. Disposal places and methods are everywhere: old abandoned dug wells (we have one), root cellars, compost heaps, wood chippers (I know; too derivative of Fargo), cesspits (we had one at our old house), large outdoor wood boilers. It would be a piquant touch to bury the body in one of the many old colonial graveyards that dot the countryside. The great Maine outdoors offers almost limitless places to commit unobserved murder and hide the body for a good long time, if not forever. Forests during hunting season, abandoned quarries, deep lakes, ocean waters, farms, snowmobile trails, ice fishing huts come to mind. Just a couple of years ago, a man down the road was facing trial for embezzling funds from a company he'd started with a friend. He disappeared, and all that was found of him was his car, parked near a hiking trail in the Mount Washington area. Did he have a hiking accident, kill himself, or stage the scene and go on the lam? Or was this a murder staged to look like that? I'm relieved that despite all the excellent weapons and circumstances to hand, and the best efforts of Murder, She Wrote and Maine mystery writers like Gerry Boyle, Paul Doiron, Sarah Graves and Lea Wait (check out the Maine Crime Writers blog, by the way), real-life Maine has a murder rate of two per 100,000. I don't have to flinch whenever I hear a chain saw start up, or lock my doors if I hear that Angela Lansbury has crossed the state line. I enjoyed this post, Sister, especially the concept of murder "in the spirit of Maine life." This idea can be extrapolated to other locations, so, for example, murder in the spirit of Washington state life would mean a poisoned plate of Chinook salmon or a body in the woods surrounded by Big Foot prints. Murder Central Coast of California style needs a clunk on the head with a surf board. Paul, how nice to hear from you. I read your column in Down East every month and was so pleased for you when publication began on your Mike Bowditch mysteries. For those of you who don't know this series, they are VERY Maine! Georgette, mightn't a Central Coast murder involve a clunk on the head with a bottle of wine? Oh nuts. I'm overwhelmed with books to read, but after reading reviews of Paul Doiron's crime-fiction debut, THE POACHER'S SON, I absolutely must add it to my pile. Yes, Sister, a Central Coast murder might involve one of our great wines, but let's be sure it's down the hatch before using the EMPTY bottle as a bludgeon.